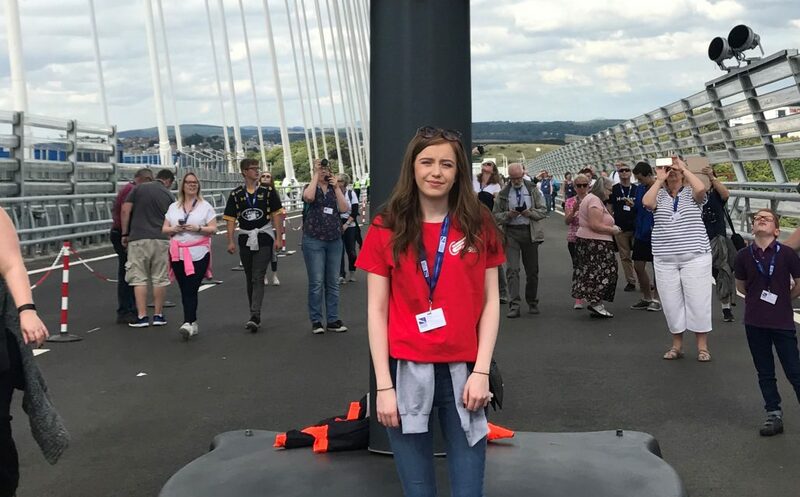 A YOUNG woman from Livingston who was chosen as one of the first people to walk the new Queensferry Crossing has ensured a local charity benefits. Alana Jamieson, an Accounts Administrator at Bathgate based Eagle Couriers, was one of the lucky 50,000 selected to walk the 1.7 mile distance across the newly opened £1.45bn Scottish landmark. Together with her mum, Tracy, and brother Kyle, Alana made the trip across the bridge to raise money for SANDS Lothians, a charity close to the family’s heart. Supporting her fundraising efforts, Alana’s employer Eagle Couriers pledged £130 and provided her with a GoPro Hero4 camera to capture the memorable event. Alana, said: “I was quite nervous for the walk but thankfully I didn’t do it alone. We didn’t even know my dad had put our names in for the draw until we had all been selected. “It was a once in a lifetime opportunity and I’m really glad to have done it for a charity that does such amazing work in my local area. Fiona Deas, Co-Director at Eagle Couriers, said: “Everyone at Eagle Couriers is so proud of Alana completing the walk to raise money for such a worthy cause. SANDS Lothians offers support to bereaved parents and their families who have suffered a miscarriage, stillbirth or whose baby dies soon after birth.